One American and one Australian. Nikki Haley is the current US Ambassador to the UN. Julie Bishop is the current Australian Minister of Foreign Aﬀairs. These two women have taken it upon themselves to not only support genocidal operations by Israel against unarmed Palestinian civil society but also to champion the cause of the Jewish State no matter what. I ﬁnd this inhumane and complicit endorsement of crimes against humanity perplexing. Especially when you know that we, the Palestinian people, have never done either the United States of America nor the Australian Federation any harm. Not in deeds. Not in words. Not even in thought. Have I become a mysoginist all of a sudden? Not in the least. I hold all women in the highest esteem. However these two politicians, who happen to be women, must be singled out for dishonesty, for bias and for their support for what can only be described as genocide on the killing ﬁelds of Palestine. Their wilful dismissal or maybe ignorance of what is actually going on in Palestine and to the Palestinians under the suﬀocating Israeli occupation is astounding. Ms Haley, is killing a further 62 unarmed Palestinian civilians by sniper ﬁre a ‘measured’ response? And does killing Palestinian children with poisonous gas bring peace and stability to the area? The situation in Gaza was not born of a reaction to a march that presented any threat to the lives of the Israeli snipers. It was born out of some tactical advice given by Arnon Sofer, Professor of Demographics at the Haifa University, to Ariel Sharon, the then Prime Minister of Israel, way back in 2004 when Professor Sofer advised him to withdraw from Gaza but close the gates to the strip and throw away the key. Here are Professor Sofer’s exact words. This, Ms Haley, is pre-mediated genocide. It will not surprise you to hear that when the UN Human Rights Council voted on a proposal to establish a transparent and independent commission of enquiry on what happened in Gaza Ms Haley voted ‘no’. Ms Julie Bishop is Minister of Foreign Aﬀairs in Australia and a potential leader of the Liberal Party which means she could eventually become Prime Minister. Ms Bishop is well-known for her ﬁrm stand against us Palestinians and for her equally ﬁrm support of Israel. 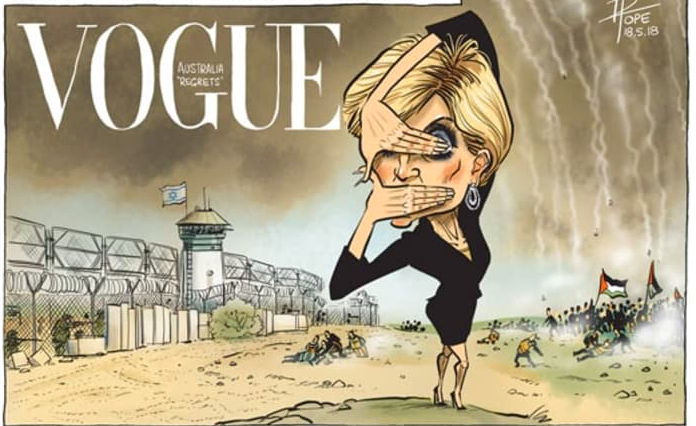 This is Ms Bishop’s reaction to the slaughter in Gaza. Ms Bishop, First, Israel has no declared borders because the Greater Israel project is still unfolding. Second, would you consider sling shots and home-made ﬁreworks constitute the kind of violence that requires a ‘shoot to kill’ military strategy? And is the killing of 112 Palestinian demonstrators and the maiming of a further 7000 the way forward to peace? Do you also think it is fair and decent to follow Ms Haley’s lead and vote ‘no’ to an independent commission of enquiry? If, as you seem to believe, Israel is maintaining its right to defend itself, then why not allow the enquiry to come to that conclusion?